Another school year is here! Classes are selected, new clothes and a book bag have been purchased, but what about all the other really IMPORTANT stuff? We have plans for their bus route and where their classes are located, but rarely do we plan for the core of their year. Let’s look at a few easy, powerful ways for how to have the BEST school year! 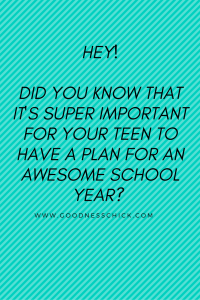 From peer group, school involvement and what happens before and after school, when we have a plan it paves the road for a great and positive school year. Don’t be an island: Our kids NEED to be involved and feel that they are a part of something. Whether it’s going out for track or bowling, the chess club or community service club kids NEED to be rooted in the culture of their school. If a young person is left to be an island, detached from structured social interaction the negatives FAR outweigh the positives. When our kids are not invested or part of something that keeps then rooted in an activity or program with a purpose the risk for depression, anxiety and poor decision making increases. The choice to hang with friends cannot supplement a club or activity. It’s simply NOT the same thing. When teens are left to their own accord to hang, chill and do their own thing it inevitably will lead to some form of poor decision making. If your child is unaware of WHAT to get plugged into, email their guidance counselor for a copy their activities packet. Take some time and flip through their options. There’s also great value in connection to a youth group. Whether it’s a synagogue or church, faith based programs are powerful and typically heavily community outreach based. When our kids receive a million outside messages about all things self serving, being saturated in an environment that is everything selfless has epic value. Part of our kids being grounded is to realize life is not all about them. To have a relationship with God and live to serve others provide a richness that is unsurpassed. Break Bread: There will be days you may not even have an hour with your child due to after school activity or work schedules. Take advantage of time together. Meal time is SUPER important. Keep TV and cell phones out of the equation. Communicate and learn about each other’s day. That includes YOU; take time to chat about how your day was. Our kids NEED to hear and ask about someone other than themselves. My heart breaks when students tell me they can’t remember the last time they had a meal as a family. It doesn’t have to be fancy. It does require being together. A meal around the table far outweighs almost any other form of family time. It may be a challenge. It may be met with initial opposition. The reality is, the fight is worth it. H-E-L-P: If there is a season in your child’s life where they battle depression, anxiety, an eating disorder or a dependence of addiction; seek help. To close your eyes, cross your fingers and pray that it will go away is unfair to your child and yourself. Help is out there. Whether it be counseling or a treatment program, support does amazing things. to address and deal with issues. Too few students or parents would agree with me. Whether out of fear of others’ opinions, the outcome of treatment or the naive hope the issue will go away; treatment is often delayed. Realize, the longer we prolong help, the longer the treatment process will be in the future. It’s just not worth it. Sleep: Our kids need more hours of sleep than we do as adults. Most of the time, they sleep much less than they physically require. You can’t make them go to sleep, but it can be encouraged in numerous ways. Try to set a certain time that lights are off. Remove distractions that keep their brain waves grooving. Both cell phones and the television should be in the ‘no’ zone when it comes to after a certain hour. They may be totally bummed and annoyed, but their day will be of greater quality due to having a solid night of sleep. There are heaps more tips and strategies for our kids to have the best school year possible. There’s a great article on challenges and opportunities for our kids and family to take on to strengthen ties and character. We want an awesome school year for them, but we have to stick to our guns and have expectations that we convey to them. You can do it and so can your young person! Let’s get ready for an awesome school year!